I spent much of the next couple years bedridden, including 2 winters where my husband was an over-the-road truck driver, so the winters were particularly depressing. Eventually, getting my adrenals sorted out, my reverse T3 reversed and eating much real food, I was much improved and wanted to garden again. Gardening is a practical hobby in that organic vegetables are very expensive, so you can easily save way more money than it costs to do. But I didn't restart gardening to save money. Nor to feed my family. I began again because gardening feeds my soul and mine was starved. 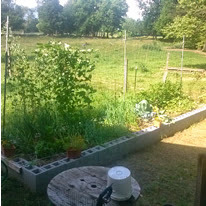 The raised bed is 4 ft across and 24 ft long, consisting of 2 courses of cinder blocks. There is a net across the north end allowing me to grow vertical crops such as peas, beans, indeterminate tomatoes, cucumbers and small melons. Because we didn't want to either dig up that much soil or buy it, we borrowed an idea from hugelkultur. Hugelkultur is basically piling up a bunch of wood as the base for your raised bed, then filling in with a small amount of dirt. The wood gradually rots, providing fertility. It also acts as a water reservoir, important for raised beds which dry out quickly. We filled the entire bottom level of the bed with logs and branches from around the yard, then topped with a layer of straw to give a flat bed to put the dirt in. When you plant in a raised bed, there a couple of considerations. One of the first is that planting intensively means you need very fertile soil. Our soil is also very heavy and given the root zone would be small, I wanted to lighten the soil to allow the roots easy penetration. So we filled the top course with a mixture of 1/3 dirt, 1/3 compost and 1/3 peat moss. As the dirt settles, I add in more compost. I can easily reach in to 2 foot, so I thought a 4 foot width was good. However, once the net is laden with vegetables, you can't reach in from that side anymore. So I think doing it only 3 foot across would be better. I also think it would have been better to do a third course of cinder blocks. While this worked relatively well for me, a bit more height would've been better still. Finally, I didn't allow enough soil depth for other than small carrots. There are 5 critical tools I needed to garden successfully in my raised bed which I'll discuss shortly. vaccinations - any middle ground out there?